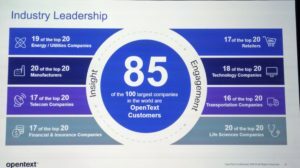 We started the second day of the OpenText Analyst Summit 2019 with their CFO, Madhu Ranganathan, talking about their growth via acquisitions and organic growth. 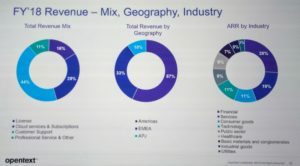 She claimed that their history of acquisitions shows that M&A does work — a point with which some industry specialists may not agree, given the still overlapping collection of products in their portfolio — but there’s no doubt that they’re growing well based on their six-year financials, across a broad range of industries and geographies. 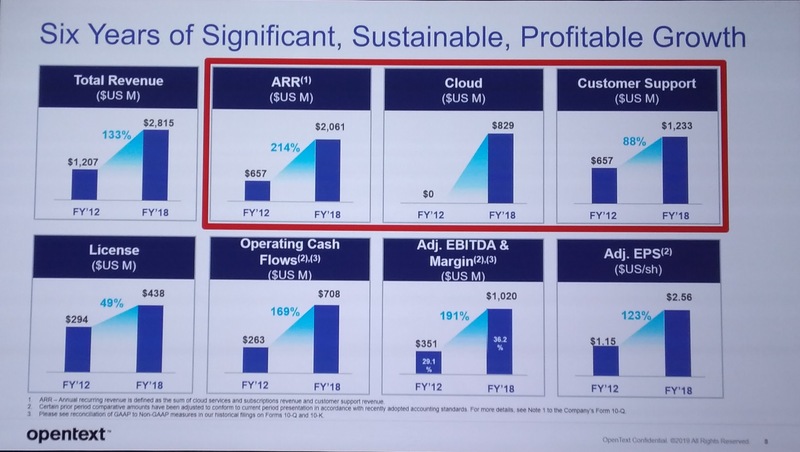 She sees this as a position for continuing to scale to $1B in operating cash flow by June 2021, an ambitious but achievable target, on their existing 25-year run. 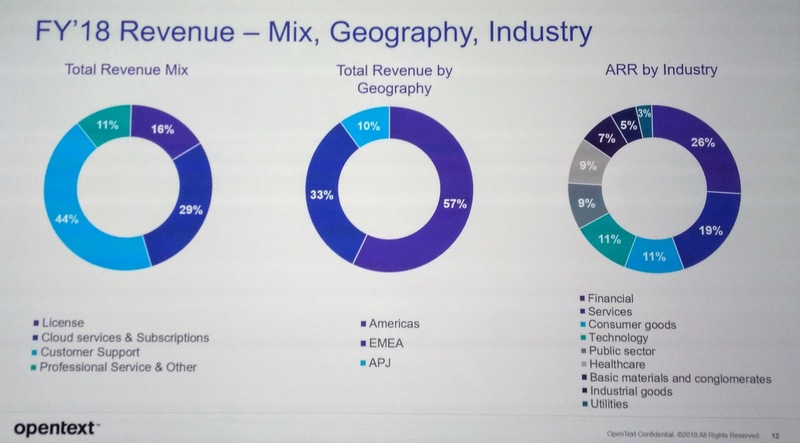 Ted Harrison, EVP of Worldwide Sales, was up next with an update on their customer base: 85 of the 100 largest companies in the world, 17 of the top 20 financial services companies, 20 of the top 20 life sciences companies, etc. He walked through the composition of the 1,600 sales professionals in their teams, from the account executives and sales reps to the solution consultants and other support roles. They also have an extensive partner channel bringing domain expertise and customer relationships. 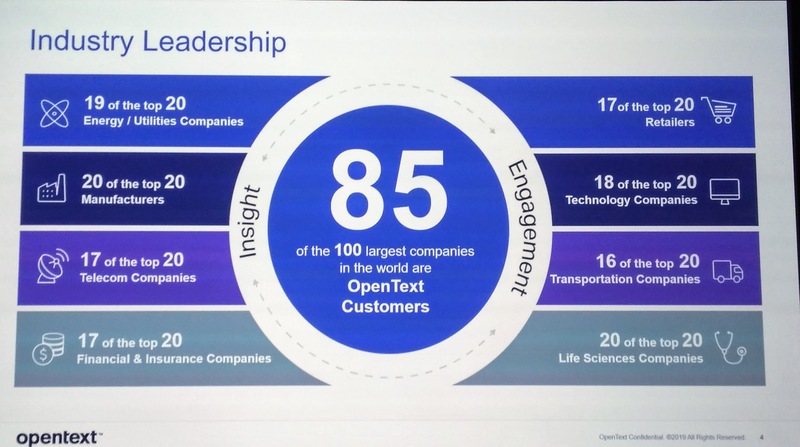 He highlighted a few customers in some of the key product areas — GM for digital identity management, Nestle for supply chain management, Malaysia Airports for AI and analytics,and British American Tobacco for SuccessFactors-OT2 integration — with a focus on customers that are using OpenText in ways that span their business operations in a significant way. James McGourlay, EVP of Customer Operations, covered how their global technical support and professional services organization has aligned with the customer journey from deployment to adoption to expansion of their OpenText products. With 1,400 professional services people, they have 3,000 engagements going on at any given time across 30 countries. As with most large vendors’ PS groups, they have a toolbox of solution accelerators, best practices, and expert resources to help with initial implementation and ongoing operations. 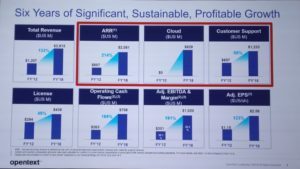 This is also where they partner with systems integrators such as CGI, Accenture and Deloitte, and platform partners like Microsoft and Oracle. He addressed the work of their 1,500 technical support professionals across four major centers of excellence for round-the-clock support, co-located with engineering teams to provide a more direct link to technical solutions. They have a strong focus on customer satisfaction in PS and technical support because they realize that happy customers tend to buy more stuff; this is particularly important when you have a lot of different products to sell to those customers to expand your footprint within their organizations. Good to hear more about the corporate and operations side than I normally cover, but looking forward to this afternoon’s deeper dives into product technology.